I am thankful for a few things and Thanksgiving always is a good time to pause and reflect. This time last year I was frustrated and stressed out over too many bills and too little income. As well I had a Roommate who didn’t see that he was renting the part of the whole and just wanted to rent his room, or rather just wanted to pay for his room. I was getting nowhere and just treading water, living in the bottom of my overdraft and all of my credit cards were maxed out. I also saw no way out. I was so stressed and was in constant crisis mode that it was a sense of normal and a way of living. I was always trying to figure out how to make sure my bills were paid, getting ahead and paying down the credit cards was a pipe dream. Now one year later not only am I in a better place financially but I have a plan and have paid off one credit card. Sure, in the span of a year, less really, I have gone from a two bedroom fully furnished Townhouse to living in an RV and parking in random parking lots and streets. My sense of normal has shifted but I am much better off now. I am less than a year away from getting those credit cards done. Then I can start building for my future, paying me. This is what keeps me going. So what am I thankful for (other than friends and family) I am thankful for my plan and having the gumption to get out there and work it. So yeah, I am thankful for Wanda and Treabilla, those who make this plan possible. I got to thinking that perhaps each ‘part’ should be its own book in its own right. That would give me more space and pages to explore each part of this long narrative in detail. As I looked at Part One I realized that on its own it has a giant chunk of it in the middle which is a flashback to Brian’s backstory. I can’t move it to the beginning because then the story is about him and not about him and Tanea. I can’t take it out because it is important to understanding how and why he is so messed up. Then I wondered maybe I could balance it with an increased storyline of what The Sisterhood (the bad guys) are doing, some large nefarious plot that we see develop. Then another idea hit me, why not take that chunk that is Brian’s backstory out and put it as its own book. The following is my idea and I think it will work. I thought then I could balance that against a different character, someone he meets and befriends later on (in what becomes book three). We could then explore both parallel storylines (a chapter at a time) of two reluctant soldiers fighting for a cause for different interpretations of the same reasons: “King, Country, Family and Honour.” At the end of each storylines we would then see how both of these reluctant soldiers end up in the same place at the same time. In book two (what remains of part one) we see that sinister storyline develop with one character as the other character struggles for survival. At the end of book two they find each other, in the midst of book three they heal each other and are fused together. I can already hear a few friends of mine screaming at me that this is a terrible idea and just write the book as it is. I am curious to see what people think of this idea. Is the juxtaposing of storylines too distracting? In any event I will let that percolate for a bit and determine the best way to do this. I may just write the book as I originally conceived it or go with this idea. Don’t worry with two wars in the mix I can come up with a fantastic, gory and shocking opening (if one more person tells me to start with the shipwreck I will scream). 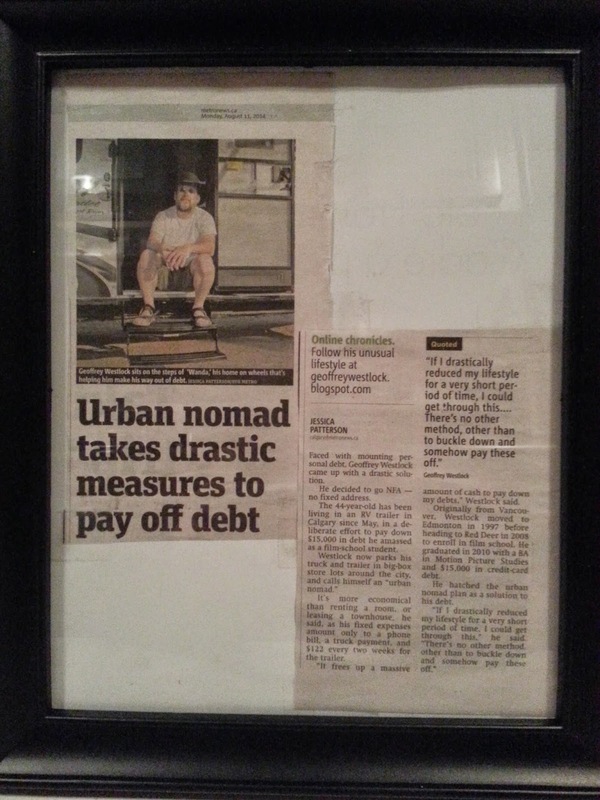 On a different note I finally framed that article which was written about me in August. A good friend of mine made sure to get me a hard copy of the article. I have been reluctant to put up pictures or decorations in Wanda and it seems that I am now ready to start. It will be a challenge to do so in a home that constantly moves, but hanging pictures and other things which makes Wanda mine will certainly help make her feel like my home. Odd but true. In the end I am thankful for my home, my plan and the creativity and the opportunity to write. It is a struggle every day to keep positive and keep going but I will keep going and make this work. In the colder weather which looks to be coming next month it will be a challenge but still not insurmountable. It is the dead of January which gives me pause, yet still another problem to solve, a challenge to overcome. Onward and upward, stiff-upper-lip and all that what.